Traditional Thai Massage How Does it Work? What is it? Thai Massage has significant importance for the well-being of the human body and the mind. Thai Massage is based upon a very simple principle and observation. Basically, it is a normal instinct to place your hand on any are of the body that suffers pain – whether that pain be from an insect bite, a strain, overworked muscles, or perhaps bruising from a fall or other damage. Not only do we place our hands upon the painful part, but we also rub – massage – it! And it works to relieve the pain. If it did not work, then we would not do it. That is the basic philosophy behind Traditional Thai Massage. Thai massage developed from this very basic instinct to place your hand upon any part of the body that suffers pain. Added to the pain relief, there is also a natural instinct – certainly in western cultures – to 'hug' a person, or even stroke a person if there is a problem of sadness or unhappiness. The same is true in many cases upon meeting a dear friend. A hug is quite normal, and often more than just a fleeting 'touch'. Not all cultures throughout the world are at ease with this custom or feeling. This certainly is true with traditional Thai people. Hugging and other forms of outward emotional feelings can cause a feeling of unease. This seems a little strange, when you consider that Thailand is undoubtedly the 'home' of massage. It has certainly caused the writer a few awkward moments, when the natural instinct for a hug – especially after a fifteen hour flight. The origins of Traditional Thai Massage go back at thousands of years, with written testimonials and instructions dating from that period. It is also part of the deeper Thailand culture and customs, and in particular closely linked to the Thai religion of Buddhism. As with most history, Thai Massage is difficult to accurately date stamp. However, details of Thai Massage were carved in stone tablets some 2,500 years ago as part of the wider aspects of the Thai Religion. The father figure of Thai Massage is Shivaga (Shivago) Komarpaj (Kpmalaboat). He was a revered healer of the time, and as such was responsible for treatment and healing of Sangha – who in turn was a close friend of the Buddha. His treatments have been documented as inclusion of Thai Massage – though of course it would not have been known by that term then. There are inscriptions set in stone, on the walls within the Wat Pho temple in the centre of Bangkok. Thai massage is part of Thai culture and is not simply a method of relaxation. 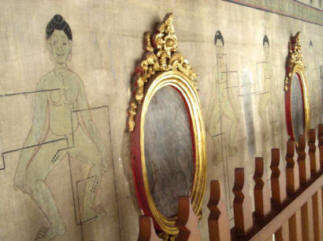 Historic illustrations on Wall of Wat Pho Temple, relating to pressure points in conjunction with the now famous Wat Pho Thai Massage. There are many historic references about the healing effects of massage in most eastern countries – including China, Tibet, Burma and India. For those in the western world, who see this form of treatment as ‘Eastern’ in origin – and perhaps a little quirky or even more patronizingly ‘Quaint’ then I simply refer you to the western bible – which has many references to massage by way of laying of hands on the sick body. The practice was certainly used by the main figure in the New Testament – and by many before the time of the New Testament. Also of course, all of the source material for the western Christian bible, originates from the East. Thai massage is not an exact science. It varies in application, and meaning, throughout many different areas of Thailand. For the main part, Thai Massage has been handed down through the many generations, with each generation, practitioner having their own particular style. In itself, Thai massage consists of aspects of reflexology, acupressure, Yoga but to mention a few. In true Thai style, different techniques are discussed by practitioners whenever they meet. What is Thai Traditional Massage? There are two words in Thai language which describe the Thai Massage “Nuad” and “Bo-Rarn”. Together, as ‘Nuad Bo-Rarn’, they describe the ancient massage techniques known as Thai Massage. In essence, the technique is little different to that practiced medically in the west. Various massage techniques are used throughout the world. We are not talking here of the seedy 20 minute job in a back street massage parlour, which maybe satisfies other real needs. If that type of massage is what you are after, then forget Thai Traditional Massage. It is alien to the genuine practitioner of Thai Massage, and is little less than insulting for such practices to be considered as massage in any true medical sense. A Thai Massage practitioner will normally be certified by the Ministry of Health. It is used throughout Thai hospitals and is the subject matter for university studies. Thai Massage concentrates on stretching and re-vitalizing aching muscles in every part of the body – from toe nail to head. It can be quite a vigorous experience – certainly invigorating – and unless you are a masochist, there will be no sexual enjoyment. That is not part of the theory or practice of true Thai Massage. It is a very serious matter – but often accompanied by the unique Traditional Thai sense of humour. This was certainly my own experience, with a masseur much smaller than myself – seemingly determined to push, twist and otherwise distort any available part of the body that could be manipulated. We both enjoyed the challenge, for I have a relative high tolerance of pain threshold, which in turn enabled her to exercise her considerable expertise and strength. I got off the massage table, wondering if I would ever walk again. No problems - or as the Thais say "Mai pen rai”. Thai massage is studied in Temples throughout the Kingdom of Thailand. The application varies according to the teaching of the various temples, but all are intrinsically linked to the Buddhist way of life. It was in existence long before the western health professionals arrived – and long may it flourish, for it is a simple – yet complex – cure for many ailments to do with both body and soul. It often reaches the parts that a pill cannot. Monks were the first person to be seen historically when a person felt ill. Thai Massage was often an integral part of any treatment. Wat Pho massage is different emphasis to Chiang Mai. Wat Pho – being the central temple in Bangkok, practices massage based upon pressure point, whereas the Chiang Mai massage seems to be aligned to stretching of muscles. Both are very effective practices, both very different from the other. Both are genuine Thai Massage. The central philosophy of the basic Thai Massage – in all its art forms – is based upon the ‘energy heel’ (Hub) within the body. It is not the heel of the foot – it cannot be seen, but is nonetheless real for all of that. Essentially, this energy hub is massaged during the process, allowing circulation of ‘good’ energy to all parts or just the affected parts of the body. A bit like taking a pain-killing tablet – but with no side effects. Once this energy heel is activated, then areas and ailments such as stomach infections, blood pressure, circulation, asthma and allergies can be rectified. Tension and stress are dealt with and most would have experienced some form of relief – even if self-applied- by some form of massage. Myself, I can almost guarantee to ease the worst headache by simple massage at the back of the neck, so I am sold on this idea from long ago. Sports massage is now an integral part of any fitness regime at any professional club in the world. Maybe for some, the appeal of decrease in waistline, and perhaps less wrinkling of the skin could the impetus to try Thai Massage. For others, a good sleep at night! Whatever the reason, get rid of your scepticism – get real, get Thai Massage!